If you’ve ever driven the Kennedy Expressway to O’Hare—or to the far Northwest Side—you know about this bottleneck. You sail through the Edens junction, and suddenly everything comes to a screeching halt. Traffic crawls along for the next few miles, until you pass Harlem Avenue. Then the highway opens up again. Why does this happen? It all goes back to the original design. No backup? Well, it was a Sunday morning! In the 1950s, when Chicago’s expressways were being built, they were geared toward moving traffic to and from the center of the city. Crosstown travel was rarely factored into the planning. Therefore, there was no ramp from the inbound Edens to the outbound Kennedy. Likewise, there was no ramp from the inbound Kennedy to the outbound Edens. The Kennedy-Edens junction was complicated enough, with three railroad lines and busy Cicero Avenue right there. Building two additional ramps would involve additional land clearance and be wildly expensive. Therefore, the planners didn’t bother with them. During the 1960s, a Crosstown Expressway was proposed as an extension of the Edens south along Cicero. This meant that a full Kennedy-Edens interchange would be built. 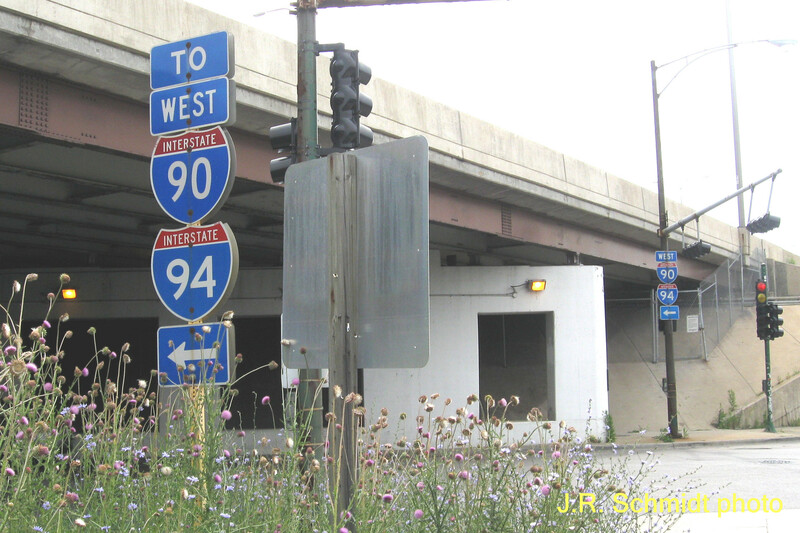 But the Crosstown was never constructed, and the Kennedy-Edens junction remained as it was. So today, if you’re on the inbound Kennedy (I-90) and want to access the outbound Edens (I-94), you drive through the junction and take the first exit at Keeler. Then you turn left on Keeler, drive under the Kennedy, and take another left up the next ramp. Now you’re on the outbound Kennedy, and can get to the Edens. You can follow the same procedure going from the inbound Edens to the outbound Kennedy—drive through the junction, then use the Keeler exit/entrance maneuver. But for this one, most drivers follow a different route. Want to get from the inbound Edens to the outbound Kennedy? Exit at Cicero-Foster, then drive west on surface streets. After a mile or so you can get on the outbound Kennedy at Foster, or at Nagle-Bryn Mawr. Now you have all this traffic getting on the outbound Kennedy at Foster, and at Nagle-Bryn Mawr. Meanwhile, there’s a significant curve in the expressway that slows things down in the stretch between these two entrances. Result—a three-mile jam back to the Edens junction. So, how to solve this mess? 1—Eliminate the Sayre exit. This exit was actually meant to serve Talcott Avenue, which was Illinois Route 62 when the expressway was constructed. The exit is little used today, and is only a few hundred feet from the Harlem exit. 2—Build segregated acceleration/deceleration lanes along the outbound Kennedy between Nagle and Harlem. 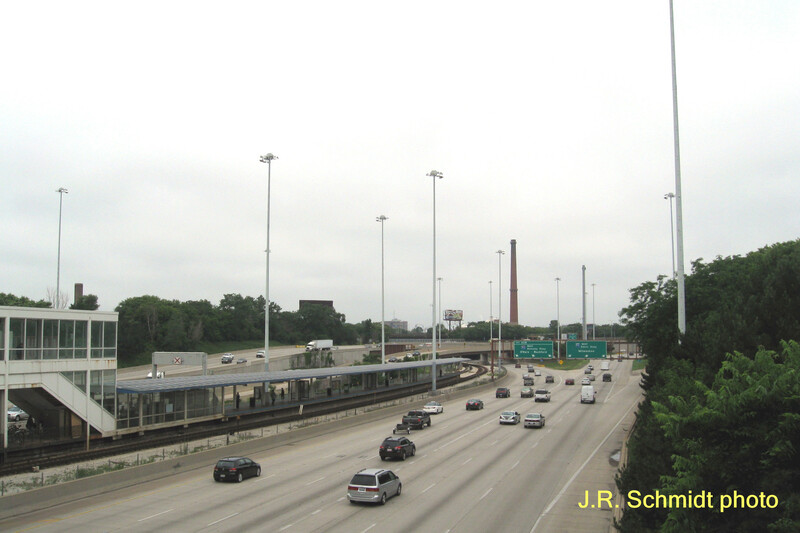 Segregated lanes were recently added to the westbound Jane Addams Tollway (I-90) west of the interchange with I-290-IL 53. Now traffic moves more smoothly there. The same idea would work on the Kennedy. There’s lots of space for these new lanes west of Nagle, though the greenery would have to be sacrificed. OK, this will cost a ton of money. But what’s a better use of our gasoline-tax revenue? I’m convinced the “hill” has something to do with the congestion. Right after the Bryn Mawr curve, the road rises. Traffic is congested up to the top of the hill, the opens up right after the crest. My wife and I, who used to travel this route nearly every day, always referred to it as the “Harlem electromagnet,” as it seemed as if a giant magnet under the roadway was slowing down outbound traffic until you got to Harlem, when it would open up as you mentioned. It generally works the same way going inbound; traffic rolls along until you get to Harlem, then starts slowing (although your mileage may vary on that one, as traffic from I-90 through the Kennedy starts slowing at Cumberland, the toll booth, the Tri-State, Lee Street, or Elmhurst Road depending on the time of day). There’s yet another reason for this problem. Because for reasons that I’ve never gotten an answer, the state never built an east/west expressway on the Far North Side [Daley’s demands that all expressways lead to downtown is undoubtedly much of the answer, but not all of it]. What we were told in the early 1960s was that Lake Shore Drive was to be extended to at least Devon & maybe to South Blvd in Evanston & an E/W expressway was to be built just north of Devon to connect to the then Northwest Expressway, now Kennedy. One reason for that location was it would’ve taken the land of two golf courses & not that many homes, although where I lived with my parents was right in the path. So what happens is that hundreds, maybe thousands of cars from the North Side & North suburbs enter the westbound Kennedy at Nagle to go to O’Hare. What’s needed is at least one, maybe two extra lanes from Nagle west to O’Hare to relieve that mess.